Maybe it's the doom predictions some folks are fearing about the end of the Mayan calendar this year or maybe these guys are obsessed with old Bruce Willis movies. Either way a class of physics students from the University of Leicester decided to evaluate whether or not the premise of Willis' 1998 "Armageddon" movie -- where a group of oil drillers is sent by NASA to detonate nuclear devices on an asteroid that threatens to destroy Earth -- could actually happen. In short - the students found that the device would need to be about a billion times stronger than the biggest bomb ever detonated on Earth -- the Soviet Union's 50 megaton hydrogen bomb "Big Ivan" -- in order to save the world the asteroid. According to the University, the students devised a formula to find the total amount of kinetic energy needed in relation to the volume of the asteroid pieces, their density, the clearance radius (which was taken as the radius of Earth plus 400 miles), the asteroid's pre-detonation velocity, and its distance from Earth at the point of detonation. Using the measurements and properties of the asteroid as stated in the film, the formula revealed that 800 trillion terajoules of energy would be required to split the asteroid in two with both pieces clearing the planet. However, the total energy output of Big Ivan "only comes to 418,000 terajoules." "A series of assumptions must be made due to limited information in the film. First, the asteroid is approximated as a spherical object 1000km in diameter (the asteroid is quoted as being the size of Texas) that splits into two equal sized hemispheres. The asteroid in the film reaches a clearance either side of the Earth of 400 miles (640km) which is the assumed value for our calculation," according to the student paper "Could Bruce Willis Save the World?" The students also said scientists would have to detect the asteroid much earlier if there were any real chance splitting the asteroid before it hit Earth. In the movie the explosions were to split the monster rock so it could pass around the Earth. On top of this, the asteroid would need to be split at almost the exact point that it could feasibly be detected at 8 billion miles, the students said. The papers, entitled "Could Bruce Willis Save the World?" and "Could Bruce Willis Predict the End of the World?" were published in the University of Leicester Journal of Special Physics Topics. The numbers come from asteroid observations made by NASA's Wide-field Infrared Survey Explorer, (WISE) satellite which looked at the objects that orbit within 120 million miles of the of the sun into Earth's orbital vicinity, NASA said. Specifically NASA said NEOWISE sampled 107 PHAs to make predictions about the entire population as a whole. Findings indicate there are roughly 4,700 PHAs, plus or minus 1,500, with diameters larger than 330 feet (about 100 meters). So far, an estimated 20 to 30% of these objects have been found, NASA stated. Previous estimates of PHAs predicted similar numbers, they were rough approximations, NASA said. Asteroids have also been in the news a lot lately. It has been widely reported that NASA could announce this month a manned project to land on an asteroid in the future. And in April Google executives Larry Page and Eric Schmidt and filmmaker James Cameron said they would bankroll a venture to survey and eventually extract precious metals and rare minerals from asteroids that orbit near Earth. Planetary Resources, based in Bellevue, Wash., initially will focus on developing and selling extremely low-cost robotic spacecraft for surveying missions. And of course Doomsday 2012 scenarios have abounded in the news for a long time. NASA has spent some time shooting these theories down - including one of a world ending asteroid. 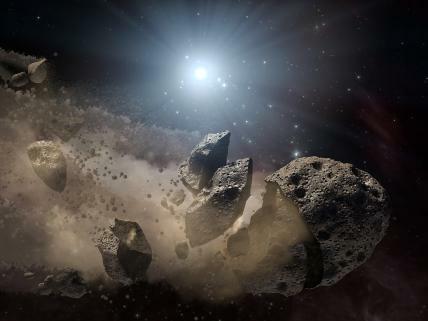 "The Earth has always been subject to impacts by comets and asteroids, although big hits are very rare. The last big impact was 65 million years ago, and that led to the extinction of the dinosaurs. We have already determined that there are no threatening asteroids as large as the one that killed the dinosaurs. For any claims of disaster or dramatic changes in 2012, where is the science? Where is the evidence? There is none, and for all the fictional assertions, whether they are made in books, movies, documentaries or over the Internet, we cannot change that simple fact," NASA stated.